So back in mid February Jack Johnson's Kokua Foundation came and asked our Ocean Appreciation club to help organize a North Shore Beach Clean up to get ready for the Kokua Festival. We accepted and put tons of work into it and the day of. We worked em. We had over 400 people show and tons of trash collected. They hooked a few of us up who organized the clean up with a private mason jennings/jack johnson show. 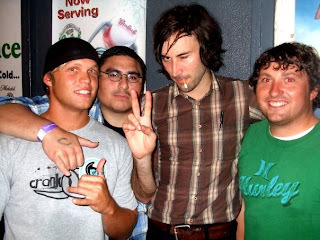 Before that concert, we went and saw matt costa at the Next Door venue and he was so good as always. Two days later was the private show with mason and jack. It was super rad. Only like 20-25 people were there and it was in this way cool radio venue with snacks and drinks and couches. It was an acoustic set which wa so rad. Here are some pictures from it. We didn't even have to zoom in to get these shots. It was for sure the coolest thing I have ever been too. Jack and I after the show. SHAKA! Thanks for the good times Kokua and drew, corey, Chantal, stu and malia. SHUT UP!!!! That is so rad! I'm way jealous. I'm excited you have a blog! Cool Dan has a blog!!! Nice one! We're glad you'll be back in a couple months! Hey Dan, So good to hear from you. Wow, looks like life is good and you have done some great things!! I love Jack Johnson. Jacks and I went to Hawaii for the first time last month and I am in love!!! I am so jealous you get to live there how exciting! I stumbled onto your blog on accident. we should really stay in touch more than at Christmas. Dan for crying out loud update your blog!!!!! Time to update the blog buddy. What are you doing for the 4th?! ?